Holy Week, which begins on Palm Sunday, is the week leading up to the celebration of Easter. As Holy Week approaches, we anticipate many who seek to worship in communion. 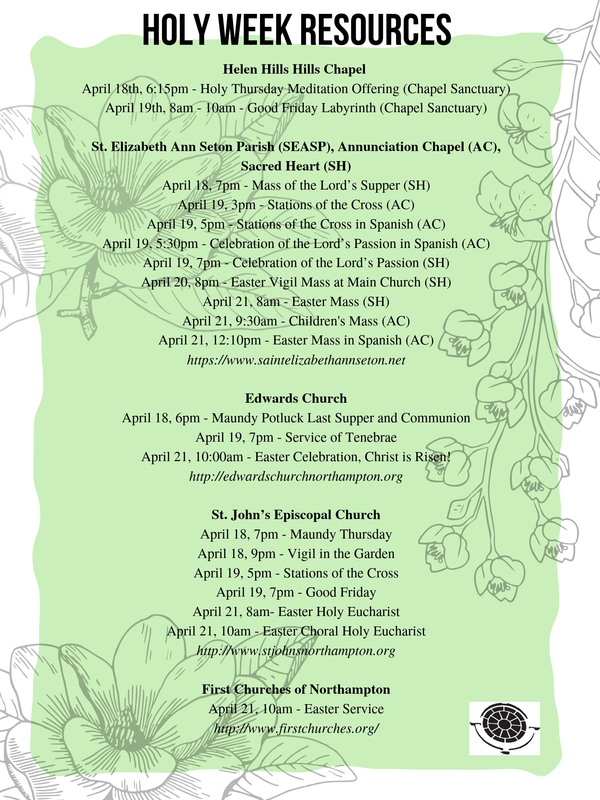 Northampton and the surrounding area(s) offer an array of Holy Week services; it is our hope that this list of resources will make special services highly accessible to anyone! Please see the graphic below. This time encourages us to rejoice in new beginnings and the renewal of spirit. May all have a blessed Holy Week and a happy Spring. This entry was posted in Student Posts and tagged campus news, Christianity, community, CRSL news, Easter, Smith Christian Fellowship, spirituality, worship. Bookmark the permalink.